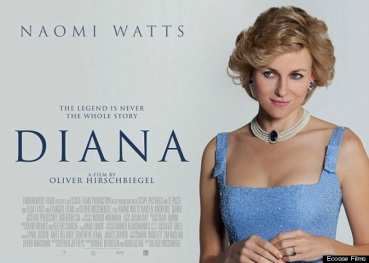 ‘Diana’ is the story of the last two years of the Princess of Wales’ (Naomi Watts) life. Directed by German director Oliver Hirschbiegel, the movie tells the untold story of Diana falling in love with a Pakistani Heart Surgeon, Hasnat Khan (Naveen Andrews). Assuming the events in the story are true, there is a lot about Diana’s personal life that the public didn’t know. One being, that the man she died in the car with August 31, 1997, Dodi Fayed, was not the man she was so madly in love with – only a mere media ploy, devised by Princess Diana herself. The movie does not focus on Diana's family, her marriage, nor her death.The focus of the movie is solely on Diana finding love, possibly for the first time in her life. As the viewer you feel very sorry for the woman who never truly experienced love, even though she was possibly the most ‘loved ’woman in the world. The movie shows a woman who was rejected by her own family, the family she married into, and even the family of the man she eventually fell in love with. While Naomi Watts didn’t completely capture the essence of Diana Princess of Wales, she tries. She’s not so off the mark that it’s distracting. And as the viewer, you eventually warm up to her as the film goes on. By the end of the film, you feel as though you understand Diana’s pain of the constant media attention, and the quest for true love. "Diana" is currently playing in theaters across the US. Check your local listings for Showtimes. the Princess of Wales and a South Asian man, Dr. Hasnat Khan. Starring two-time Oscar nominee Naomi Watts and award-winning actor Naveen Andrews, DIANA uncovers the final two years in the life of one of the world’s most famous and most loved women. SYNOPSIS: DIANA takes audiences into the private realm of one of the world’s most iconic and inescapably public women -- the Princess of Wales, Diana -- in the last two years of her meteoric life. On the occasion of the 16th anniversary of her sudden death, acclaimed director Oliver Hirschbiegel (the Oscar®-nominated Downfall) explores Diana’s final rite of passage: a secret love affair with Pakistani heart surgeon Dr. Hasnat Khan the human complications of which reveal the Princess’s climactic days in a compelling new light.